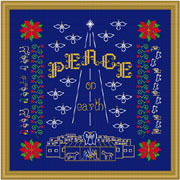 The 3 Kings with their entourage, and shepherds with their sheep, are following the star to the holy family. An angel choir fills the sky. Poinsettias and vine add decoration. Floss may change.